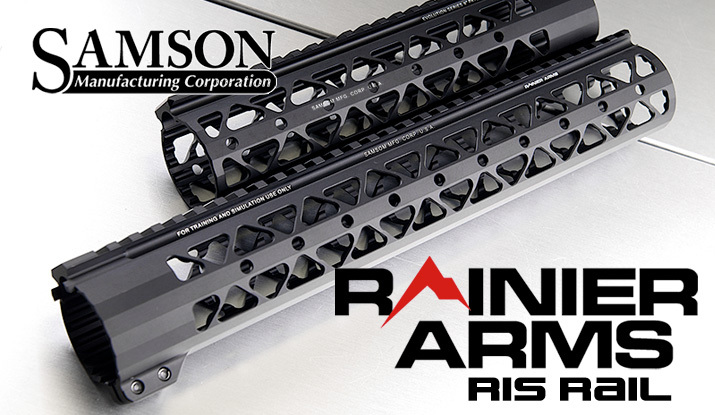 The truss-like design of the RWA Samson Rainer Arms Rail Systems is a tried and true engineering concept that retains incredible structural integrity while minimizing weight of construction. In addition to this, the interior of the rail system features structural ribbing further reducing weight. All this slimming and reduction of material is to improve maneuverability and balance of an AR platform equipped with such a system, with the side effect of making the gun easier to transport and carry around as well. Despite the focus of the RWA Samson Rainer Arms Rail System being weight reduction, it doesn't sacrifice customization ability to achieve its goal. Rails can be mounted along any point of the handguard where there are screw holes, or even used to mount accessories directly. The markings that are laser-engraved on the rails are officially licensed thanks to RWA, and are made to as close to authentic as possible.